Being poisonous can only protect you if potential predators know you’re poisonous. Many plants and animals have evolved protective coloration that bellows it in big, bad-tasting letters: “EAT ME AND DIE.” This is a great strategy, but it’s not always enough; after all, some predators hunt in the dark. Some poisonous prey animals have gotten creative. 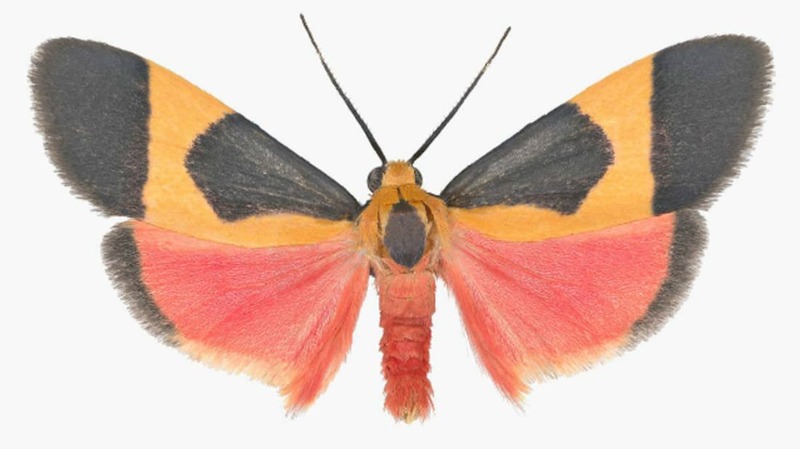 Biologists say at least two species of tiger moths use sonar to broadcast that warning message—and it works. The research was published in the journal PLOS One. For the last 65 million years, tiger moths have been embroiled in an evolutionary arms race with the bats that eat them. To keep the bats from biting, the moths have adapted to eat poisonous plants and absorb their toxins. Many, like the Cisthene martini specimen shown above, have developed bright, stop sign-style coloration. They’ve also grown little noise-making blisters called tymbals on their bodies. These tymbals make clicking noises that, when deployed correctly, can actually jam bats’ sonar and make the moths harder to find. Previous studies have also shown that poisonous tiger moths emit a type of click that sounds like an “I TASTE TERRIBLE” message, but they hadn’t determined whether these messages actually work, or how they evolved. Wake Forest University biologist Bill Conner contributed to much of that earlier research. In the current study, he and graduate student Nick Dowdy aimed to test the efficacy of the moths’ defensive messages. They set up a kind of moth/bat combat arena in the field, in Cochise County, Arizona. They collected two species of tiger moths: Pygarctia roseicapitis and Cisthene martini. The researchers divided the moths into three groups. One group, the control group, was left alone. Moths in the experimental group had their tymbals removed, while those in the sham control group underwent a similar surgery, but their tymbals were left intact. This allowed the researchers to check if the behavior of the moths with no tymbals was being affected by the trauma of surgery. The researchers set up audio recorders and infrared video cameras, then released the moths one at a time and waited for the bats—all wild—to arrive. Observers near the arena watched the action to see if and when the bats flew close enough to the moths to hear their clicks. After all the moths had run the wild bat gauntlet, Conner and Dowdy analyzed the footage. Back in the lab, they played bat noises for captive moths and recorded and analyzed the moths’ clicking responses. There was no doubt about it: The moth clicks were definitely telling the bats to back off, and the bats were listening. But Dowdy and Conner noticed differences in the two moth species’ behavior. When P. roseicapitis moths were under attack, they broadcast the I-taste-bad message, but they also used evasive flight maneuvers like diving to physically get out of the bats’ way.C. martini moths were much more chill, relying exclusively on the protective power of their clicks. This “nonchalance continuum,” as Dowdy calls it, suggests that some tiger moth species are more acoustic-centric than others. As evasive maneuvers take a lot of energy, clicking might represent moths’ most efficient, most recently evolved weapon in the arms race. "This means that in evolutionary history, these moths first evolved these sounds for use in warning bats of their toxicity, and then sometime later, these sounds grew in complexity in certain species to perform a sonar-jamming function," Dowdy said.